Audi’s synthetic fuels: is this the breakthrough we’ve been waiting for? A couple of years back, German automaker Audi quietly opened an e-gas plant in Werlte, Germany. The factory — which is run on renewable energy — uses electrolysis to split water into oxygen and hydrogen. And this hydrogen is used to power fuel-cell vehicles, right? Wrong. For the time being at least, Audi instead employs methanation — reacting said hydrogen with carbon dioxide — to produce synthetic methane, or e-gas. And this gas (which it says is “virtually identical” to natural gas) is then used to power decidedly uncommon compressed natural gas vehicles like the Audi A3 Sportback g-tron. Of course, outside of Germany, there’s even less automotive demand for e-gas. But the Ingolstadt manufacturer has other – arguably more appealing – non-fossil-based tricks up its planet-saving sleeve. Yes, Audi recently invented first a synthetic diesel and then a so-called petrol replacement dubbed e-benzin. Unlike mineral diesel, Audi’s e-diesel is completely free of sulphur. Essentially, it’s made from CO2 and water (again using renewable energy). Steam is broken down into hydrogen and oxygen via electrolysis, before the hydrogen is reacted with CO2 (which is pulled from a biogas facility and the ambient air). This results in a liquid called “blue crude”, which is then further refined to create the e-diesel. 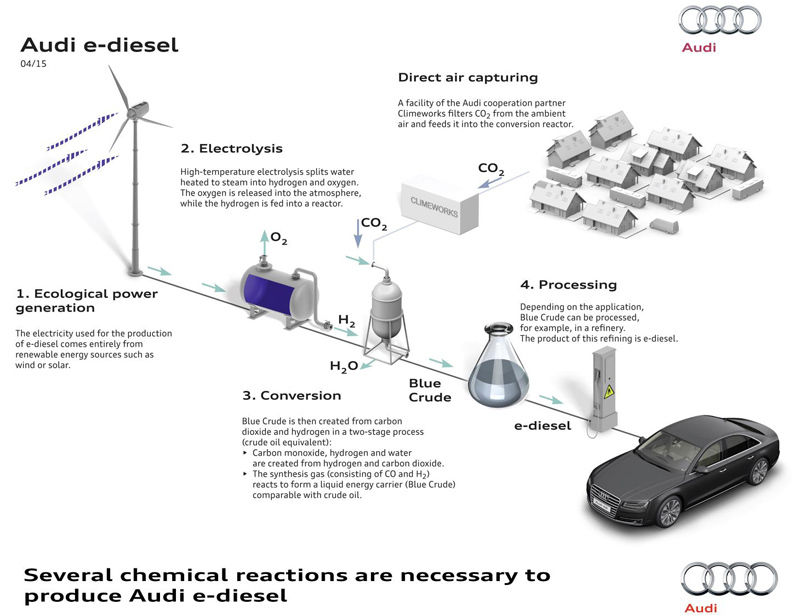 Interestingly, Audi says that its chemical composition means it can safely be mixed with traditional diesel in any quantity, effectively serving to make any tank of diesel “greener”. Production in Germany right now is fairly low, although Audi and its technical partners are clearly hoping the new fuel will catch on soon. The brand’s clean-burning “synthetic gasoline”, however, is perhaps even more interesting, and was developed in France by another of Audi’s project partners, Global Bioenergies. It’s produced by first converting renewable biomass sugars – such as corn-derived glucose – into isobutane gas (a fairly widespread substance in the petrochemical industry), and then purifying it into a liquid form. 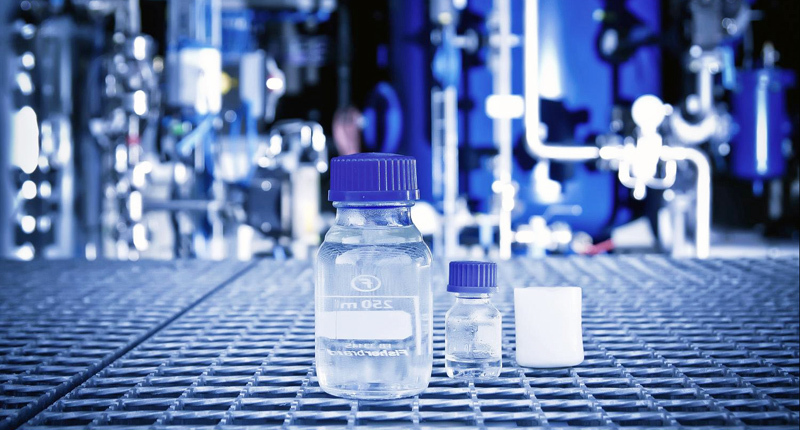 From here, the liquid is shipped off to Germany in pressurised cylinders, where it is further refined and converted into iso-octane fuel, and then, eventually, Audi’s clever e-benzin product. This fuel contains neither sulphur nor benzene, and thanks to its 100-octane rating, can be used in high-compression, high-performance engines. Not content with that, however, the German luxury car-maker now says it hopes to – before the end of 2016 – tweak the manufacturing process further so as to allow the complete exclusion of biomass from the equation. Now that’d be quite a win. For now, Audi will continue testing its petrol and diesel substitutes using small fleets of its own vehicles, in order to learn exactly how these new substances behave in real world. If successful – particularly if and when a biomass-free version of e-benzin is realised – the tests will increase in size, before the products are eventually rolled out to the public. So, when can we expect to start ditching fossil-based fuels? Well, Global Bioenergies CEO Marc Delcourt says e-benzin will be “in the tanks of our cars, very soon, on a large scale”. We’re guessing this translates to a couple of years at least. Still, it’s refreshing to see Audi taking what is ostensibly an alternative route to reducing the motoring world’s age-old reliance on oil. While most rival automakers are focussing their efforts on full-electric or hybrid development – desperately groping for that much-needed breakthrough in extended-range battery technology – Audi is also placing a distinct emphasis on replacing traditional fuels with synthetic, harmful-emission-free equivalents. And, provided it can continue to power the process pretty much exclusively with renewable energy – something that won’t likely be easy if and when production hits a truly large scale – and price the product competitively, the German automaker may just have a winner on its hands. After all, what self-respecting petrol-head wouldn’t get behind a product that could well turn out to be the internal combustion engine’s saviour?